And, despite the reports from the biased media, real progress is taking place in Iraq. 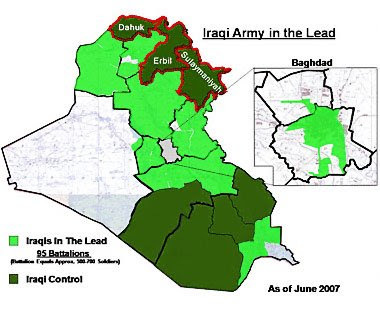 Threat Level: U.S. and Iraqi commands examine the threats to the security of a province. If Iraqi Provincial authorities can ensure security and domestic order through the normal use of local police, the province is ready for transfer. Iraqi Security Forces: The Iraqi Security Forces in the province are studied to determine if their training, equipment and capability are capable of protecting Iraqi citizens. Governance: The governor must be capable of overseeing security operations. A Joint Operations Room must be capable of coordinating activities. An Iraqi Ministry of Defense and Iraqi Ministry of the Interior intelligence structure must support the Iraqi Police. Multi National Force – Iraq: MNF-I must be capable of reinforcing Iraqi Security Forces if necessary. Coalition Forces will continue to help coordinate civil reconstruction projects. MNF-I will conduct activities in conjunction with the policies of the Iraqi Ministry of Interior and Iraqi Ministry of Defense. A Jacksonian has the latest on the “Operation Phantom Thunder” offensive from reports coming out of Iraq. Michael Yon has encouraging news on “Operation Arrowhead Ripper” now in progress.